Scheduled for construction in 2009, a 3,000-square-foot residence for the Houses of Sagaponac blurs the boundary between indoor and outdoor spaces. In the introduction to their recently published Atlas of Novel Tectonics, the husband-and-wife team of Jesse Reiser (AR’81) and Nanako Umemoto (AR’83) write that “beneficial novelty is the preferred condition to stability and the driving agenda behind architectural practice.” Almost 7,000 miles from the New York City office of Reiser + Umemoto, RUR Architecture P.C., this long-held belief is being put into practice as the firm’s first major built work begins to take shape in the architectural hotbed of Dubai. The 22-story office tower, named O-14, is remarkable for inverting the typical arrangement of high-rise buildings; rather than a structural core with a curtain-wall façade, it will feature a concrete exoskeleton perforated with more than 1,000 custom-shaped openings. Scheduled for completion in spring 2009, O-14 demonstrates the kind of forward-thinking research that Reiser and Umemoto have been pursuing over the past two decades through dozens of design competitions and exhibitions as well as years of teaching experience. The story of Reiser + Umemoto begins both in the village of Dobbs Ferry, NY and the city of Kyoto, Japan. In Dobbs Ferry, Reiser’s early interests in art and science were influenced by his mother, the architect Debora Reiser; his father Samuel, whose true callings are philosophy and Eastern thought; and his maternal grandfather, an engineer. Meanwhile, as a child in Kyoto, Umemoto was surrounded by art, science and building: her mother was a kimono painter, her father a bio-physicist and her grandfather a developer. After graduating, Reiser went on to get his master’s from the Cranbrook Academy of Art in Bloomfield Hills, MI, where Cooper Union alumnus Daniel Libeskind (AR’70) was the head. Reiser worked in the offices of both Hejduk and Aldo Rossi, the Italian architect who also taught at Cooper Union, as well as for his mother in Dobbs Ferry. Umemoto also worked for Debora Reiser after graduating, as well as for a short time in the office of Minoru Yamasaki, the architect of the World Trade Center. Reiser and Umemoto began collaborating in 1984 at the American Academy in Rome, where Reiser was a Rome Prize Fellow that year. Their collaboration continued back in the United States, initially operating out of the Reiser family garage in Dobbs Ferry. After stops in the Bronx and another office in Manhattan, the firm settled on the Upper East Side in 1998, where it has been ever since. The size of the staff varies from eight to around 20, depending on the workload. Reiser says that the formation of the office was strongly influenced by Rossi. “We patterned the office on a European model—which was crazy—and that got us into doing competitions for 15 to 20 years,” he says. “That is sort of the norm in Europe but unusual for the United States. With O-14, the notable innovation is its perforated concrete exoskeleton. The commission came about through an invited competition for another project in Dubai that called for a mixed-use tower complex in the city’s Business Bay. Reiser + Umemoto’s design may not have won—Zaha Hadid’s “Dancing Towers” scheme was chosen—but it attracted the attention of the competition’s organizer, who commissioned the firm to design O-14. In addition to creating a striking appearance, the concrete shell both addresses the question of how to build in the desert and produces sustainable benefits. “The typical corporate architect’s response in that climate is to do curtain-wall buildings with very dark glass to offset the sun,” says Reiser. “By pulling the structure to the outside, we use it to shade the building and free up the interior space—there is no longer any need for interior columns. The firm’s long-span concrete-shell proposal placed second in an invited competition to design a new terminal at the Shenzen Bao’an International Airport in China. In 2002, Reiser + Umemoto led the international group of firms, collectively known as United Architects, that was one of the seven finalists in the competition to design a master plan for the former World Trade Center site in lower Manhattan. United Architects’ plan called for five self-supporting towers that would meet high at the 55th floor, thus increasing their structural strength. In 2003, Reiser + Umemoto won a competition to develop a master plan for Taiwan’s Alishan Forest Railway, a timber line that was originally built by the Japanese at the turn of the of the 20th century. The plan will rejuvenate the rail route as an agricultural strip lined with a series of “slow food” restaurants and develop two stations and infrastructure to support increased tourism. Urban design has been as integral to Reiser and Umemoto’s practice as architecture—they regard the two disciplines as inherently connected. In 1997, they were the recipients of the first Van Alen Institute fellowship for researching and designing 12 miles of Manhattan’s East River waterfront from the Battery to the Triborough Bridge. Their East River proposal led them to be selected to compete for the conceptual design of the West Side Railyard site in an international competition sponsored by the Canadian Center for Architecture. In all of their projects, Reiser and Umemoto collaborate on every aspect of the design process. Umemoto notes that while they don’t always agree, the work always ends up improving as they iron out their differences. “Whenever we show a project, everyone asks, ‘What did Jesse do and what did you do?’ But we don’t work that way. Both of us are so involved—he may be strong at one moment and I may strong at another moment, but in the end it’s all mixed.” Reiser and Umemoto also both teach as much as they practice. Since 2000, Reiser has taught at Princeton University, where he is currently an associate professor. He was an assistant professor at Yale from 1990 to 1992 and at Columbia from 1992 to 2000. Umemoto was an assistant professor at Columbia from 1992 to 2000. She has also taught at Princeton, the University of Pennsylvania, Cooper Union and, most recently, at Hong Kong University. Both note that being at Columbia in the 1990s was a crucially formative experience. “We had a lot of contemporaries who we exchanged ideas with,” says Reiser, “including fellow Cooper Union graduate Stan Allen (AR’81)—now the dean of the Princeton School of Architecture—Greg Lynn and Ben Van Berkel, as well as the theorists Jeffrey Kipnis and Sanford Kwinter. It was both education and self-development.” Their awards over the years include a 1998 PA Award, which was given by Progressive Architecture magazine in recognition of cutting-edge design work; a 1999 Chrysler Award for excellence in design; a 2000 Academy Award in Architecture from the American Academy of Arts and Letters; and a 2002 AIA Award for a competition design for the BMW plant in Leipzig, Germany. This year, they received Cooper Union’s Presidential Citation. The firm’s designs have appeared in countless exhibits around the world. 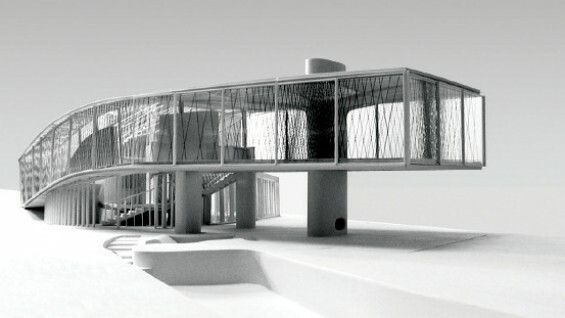 Recently, the model for the Sagaponac house was included in the permanent collection at the Museum of Modern Art in New York City; forthcoming exhibitions include a showing at the Tel Aviv Museum of Art in Israel and the Home Delivery show at the Museum of Modern Art. The Atlas of Novel Tectonics was published in 2006 by Princeton Architectural Press. Underscoring its popularity, Japanese and Russian language versions are scheduled for publication later this year. A monograph of the firm’s work, Projects and Their Consequences, is also forthcoming from the Spanish publisher Actar. Today, Reiser and Umemoto live in the New York City with their teenage son (“he’s a Cooper baby!” exclaims Umemoto)—and continue their ongoing research and design work. In the near future, that research and design will result in another project in Dubai—the firm is currently working on a scheme for a new 30-story building there.